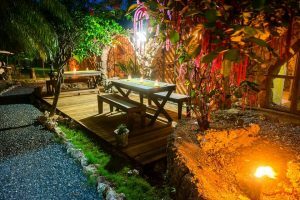 Looking for the Best Utila Restaurants? 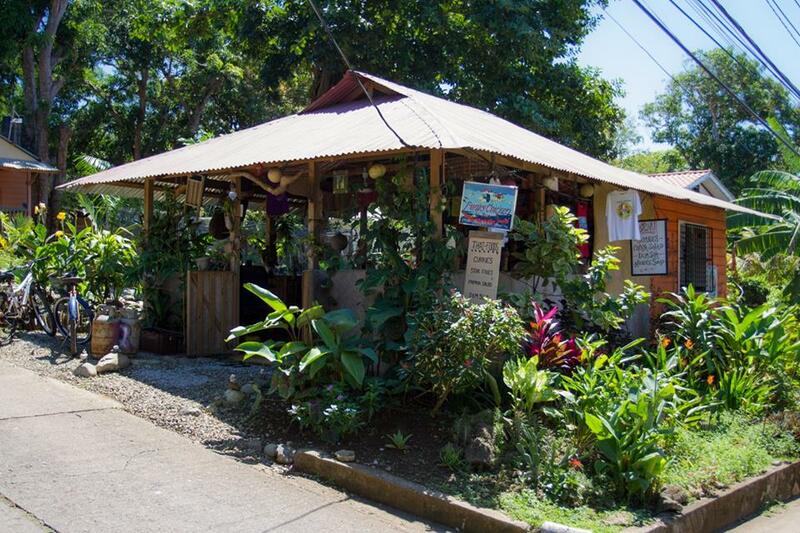 Although a relatively small island, there are many different Utila restaurants to choose from on the island! 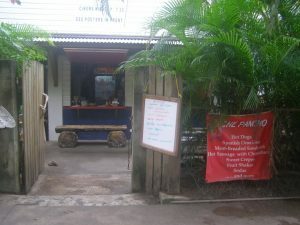 Some of these Utila Restaurants are actually very unique and original, and others can be somewhat basic and actually informal. For a truly local food, try the food stalls located around the corner where the municipal dock meets the main street. These stalls offer the very typical “Baleadas” a wheat tortilla that is stuffed with beans and a bit of dry cheese, although they can get fancy and include eggs, sausage, and even meat. The other typical meal to be had there are the “pastelitos” fried stuffed salty pastries that have beef, chicken or even fish in the insides. 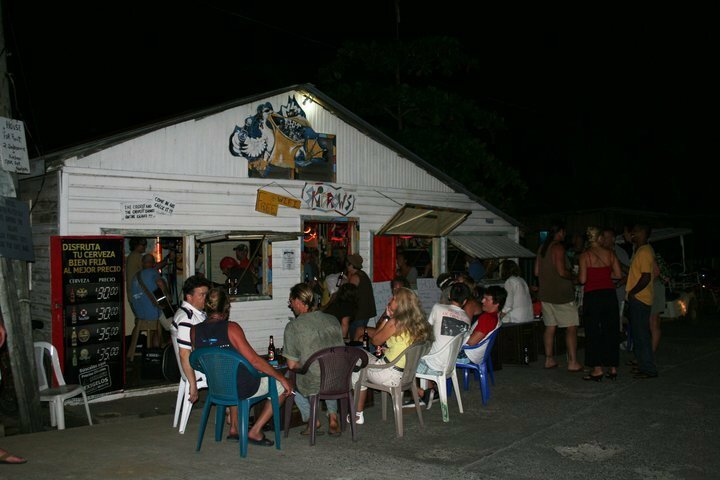 In addition to the above, following you will find our list of Utila restaurants. I hope you find the perfect spot for you! Personally my favorite of all Utila restaurants! Mango Tango is located on the beach at the Margaritaville Hotel. This is where the old and famous Driftwood Cafe used to operate on the West End of Town towards Chepe’s Beach. The restaurant is located on a spacious deck overlooking the Caribbean Sea. It is usually a cool spot, where you catch the sea breeze and enjoy great sunsets. Menu is great, offering great pasta dishes, and great lionfish burgers among other items. Open Monday through Saturday for breakfast, lunch and dinner, from 8:00 a.m. till 10:00 p.m. and Sundays for lunch and dinner from 11:00 a.m. till 10:00 p.m. They also offer a complete international bar and great ice cold beer. RJ’s is arguably the best BBQ restaurant on the island. Order beef, pork or chicken, all BBQ’d on the grill and cooked to perfection. 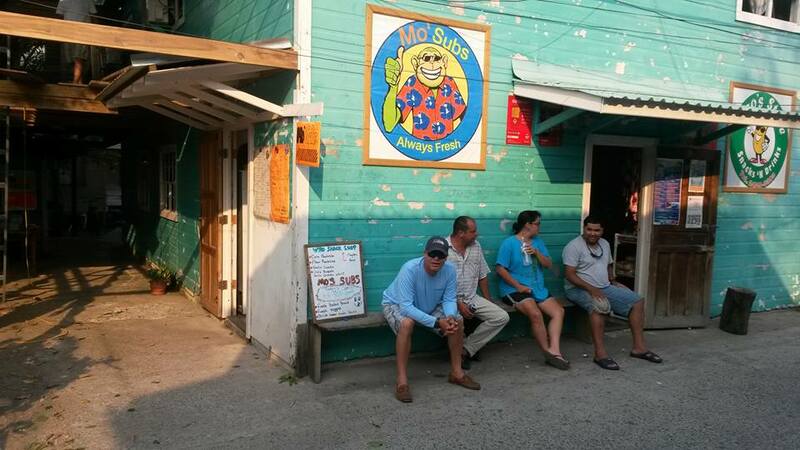 The only drawback with this great place where to eat in Utila is that they do not open daily! Open Wednesday, Friday and Sunday from 5:30 p.m. till 10:00 p.m. RJ is a popular spot for dinner. Located on the east end of town, close to the bridge at The Point, RJ is certainly worth the walk to get there! Great ice cold beer. Portions are huge, and their homemade desserts are outstanding. El Castillo is a great restaurant located in a funky building, built like a castle but with Caribbean materials, resulting in a truly unique space. Owned by an Austrian couple, El Castillo features Austrian-Caribbean cuisine. Menu includes great fresh fish, as well as pork, lamb and beef selections. 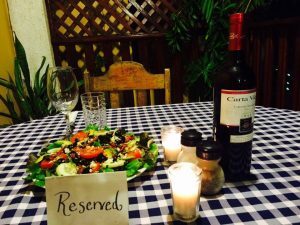 Reservations are recommended, since they are only open of Friday and Saturday nights from 5:00 to 10:00 p.m. El Castillo offers the perfect setting for that special, romantic dinner in Utila. 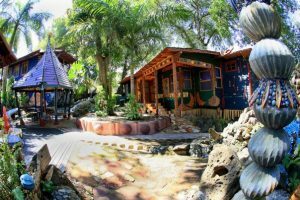 It is located just off the main road, towards the Colibri Hill Hotel. El Castillo is considered by many expats in the island as one of the best Utila Restaurants. Located across the street from Ecomarine Dive Center, Skid Row is open daily from 10 a.m. till 10 p.m. Menu includes burgers, sandwiches, pizza and of course fresh seafood dishes. Famous for its guifity challenge, where guests need to take a certain number of shots to “earn” a tshirt, Skid Row is one of the more popular and certainly rowdy spots on the island. Friendly staff and good food. Located right on the water and next to the popular Chepe’s Beach, Rehab offers great fresh fish, outstanding chicken wings and a selection of other foods. French Fries are the best on the island, and the setting is truly unbeatable. Service is good, and the restaurant is open daily from 9:00 a.m. till late. Truly one of the favorite spots in Utila! Relax under the covered deck and enjoy the view or sit out in the sun and work on your suntan! Relapse is a great alternative when it comes to defining where to eat in Utila. Great view from the deck at Rehab! An institution in town! Rehab has long been one of the a favorite Utila Restaurants. Lee, the original owner sadly passed away early in 2017. His family moved from the original location next to Chepe’s beach (where Relapse is now located) to their present location downtown. Relax is open daily from noon till 10:00 pm, sometimes later. They offer the same menu, with great fish dishes, outstanding wings and the best french fries on the island. 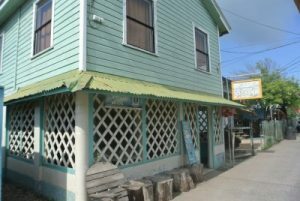 I was last in Utila in February 2018 and was sad to find the Rehab has closed its doors. 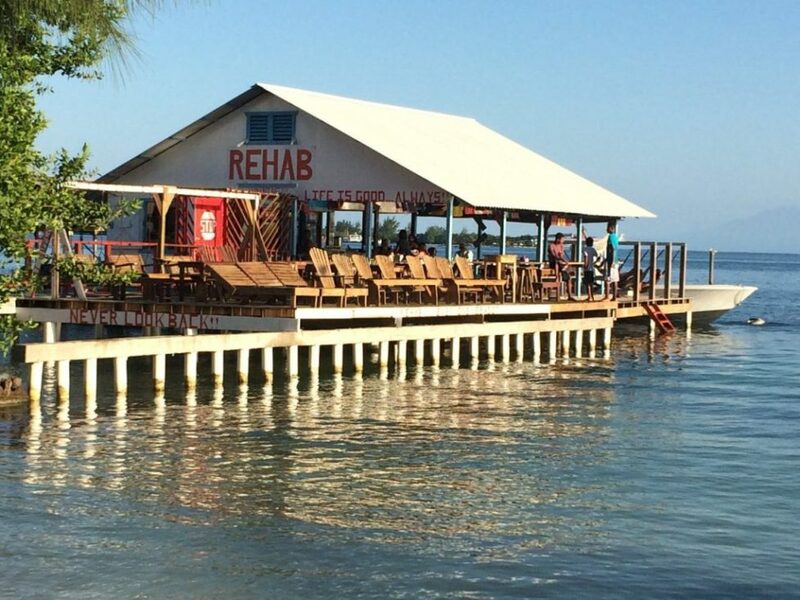 RIP Rehab Bar in Utila. 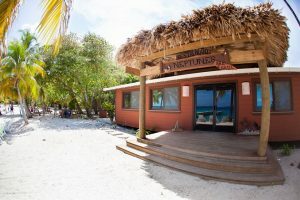 Located across the street from the Utila Dive Centre, this is the perfect spot for a quick bite! Home baked fresh sub bread stuffed with your choice of selections. Daily special subs. Choose your favorite ingredients and have a tasty, filling meal. Island style cooking at its best. If you are curious about island food, then eat here! A small area in the downtown section of a Utila home serves as the setting for this eatery. Try their huge baleadas, their coconut chicken and diverse veggie options. This is a true family owned and operated restaurant, with mother and daughter being a great team together. 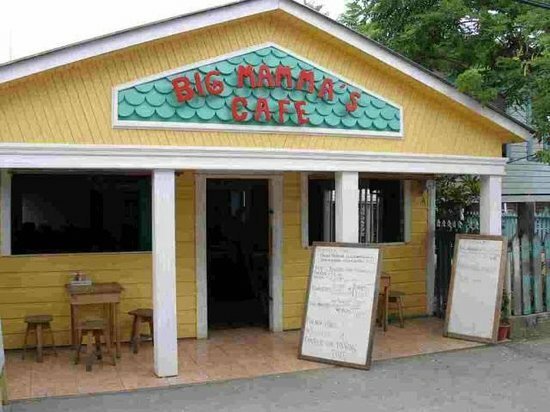 Big Mamma’s is open Thursday to Tuesday from 11:00 a.m. to 3:00 p.m. and from 6:00 p.m. till 9:30 p.m. Very reasonable prices! Many consider this Big Mamma’s the true original of all Utila Restaurants. 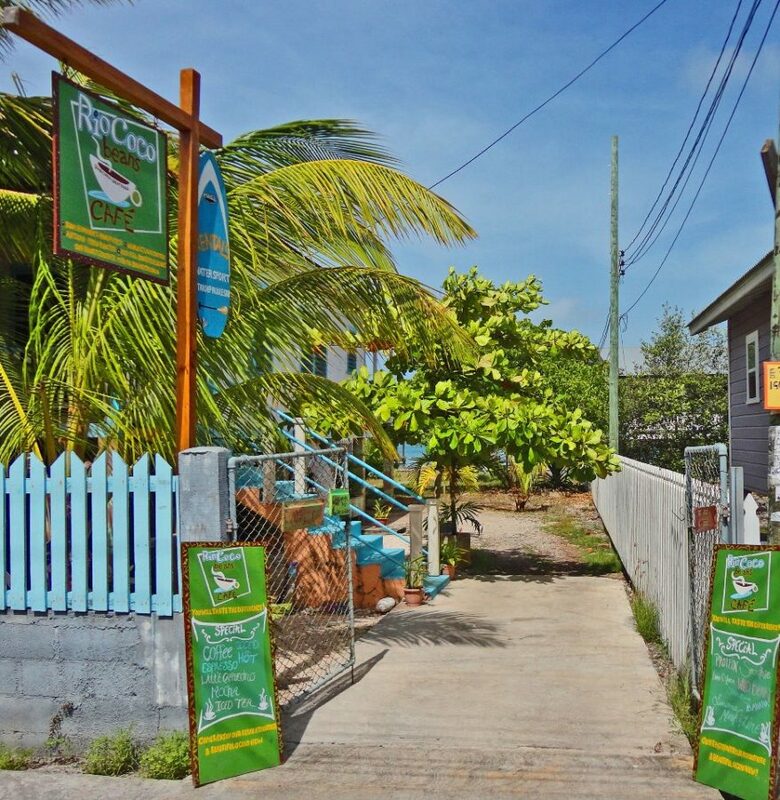 Located in the oldest home in Utila, Munchies is conveniently located just a short distance from the municipal dock on Main Street. You can choose between the porch overlooking the street, inside seating or the iguana garden in the back. Personally, I prefer the front porch, as you can enjoy seeing people coming and going along the pedestrian street. Burgers, salads, sandwiches and veggie options all available in their menu. Check out their coffee and deserts! Open daily for breakfast, lunch and dinner. 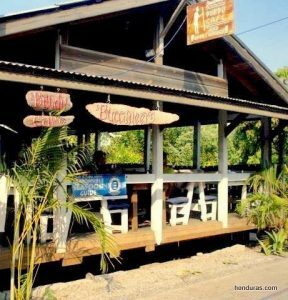 Rio Coco is the best coffee house in Utila! Open Monday through Friday from 7:00 a.m. till 2:00 p.m., this is the place to go to for an outstanding cup of coffee to get your day started. A very pleasant setting, including a dock overlooking the Bay of Utila and the Caribbean provides the ideal spot for a great breakfast. Coffee, baked goodies, bagels with cream cheese and Yogurt are on their menu. Rio Coco Café is part of an organization that runs with volunteers, and its profits go to helping a remote Miskito Community on the Nicaraguan side of the Rio Coco, which is the border between Honduras and Nicaragua. 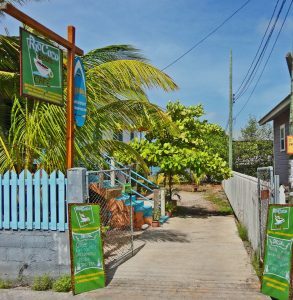 Rio Coco Café is located on the Main Street in the Point. Part of the Underwater Vision Dive Shop, and located at Trudy’s hotel, this pleasant restaurant offers homemade food at reasonable prices. Trudy’s is open seven days a week and serves breakfast, lunch and dinner. One of the few Expresso Coffee machines in the island is located right here, so if you need a cup of real coffee to get you started, this is one of your best options. Hearty breakfasts at affordable prices, great lunches and outstanding dinner specials including Friday night Pizza, Saturday night BBQ are all a great value. The Argentine corner in Utila! Che Pancho is the place to go for a milanesa or a choripan if you are in a mood for an Argentine dish. They also offer great sandwiches and salads as well as great fresh fruit milkshakes. 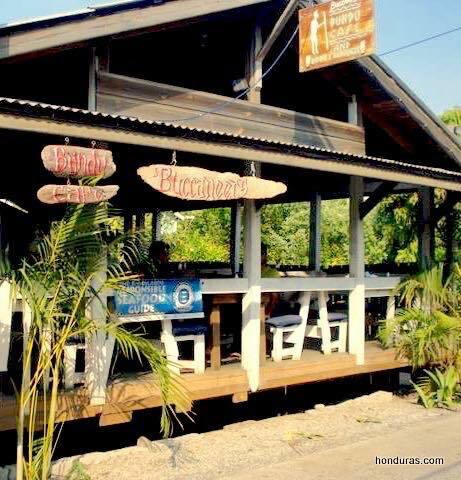 Che Pancho is located under the Utila Cinema, and is open daily for breakfast and lunch from 8:00 a.m. till 6:00 p.m. except on Sundays when they do not open. The Seven Seas restaurant is one of the typical restaurants in Utila. one of the few typical Utila restaurants, featuring baleadas and other local meals, such as fried breadfruit, locally known as “masapan”. 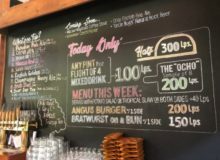 Setting is simple, and the prices are truly affordable, making it a great option if you are on a budget and want to get a taste of local cuisine! Seven seas is open daily for breakfast lunch and dinner. 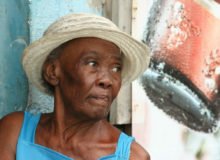 Located right across Che Pancho on Main Street, Baleadas Mama Rosa offers basic local food at great backpacker prices. This of course, is enough to make it really popular with the backpackers and budget tourists! Open daily, Mama Rosa offers baleadas, pastelitos, pizza and other basic Honduran meals. Not fancy, but definitely tasty. The best buffet restaurant in Utila. Always a nice variety, with options usually including some Chinese & Creole options, veggie dishes and local island food. Very reasonably priced, with good, friendly service and a small store where you can buy some fresh fruits and veggies. Open for lunch and dinner from Sunday to Thursday from Sunday to Thursday 11:00 a.m. till 10:00 p.m. Friday 11am – 3pm, Saturday 6pm – 10pm. Mermaids is one of the oldest Utila Restaurants. Formerly the Bundu Café, Buccaneers Grill is a great spot for breakfast, lunch and dinner. The deck up front facing the street is truly pleasant and usually cool. Service is good, beers are cold and prices are right. The Buccaneer also offers the most complete book exchange in Utila. Open for breakfast and lunch from Thursday to Tuesday (Closed Wednesday) from 8:00 a.m. till 3:00 p.m. On weekends, (Friday, Saturday and Sunday) they are also open for dinner from 6:00 p.m. till 9:30 p.m. Buccaneers Grill offers outstanding breakfasts, with banana pancakes being one of their specialties. For lunch, try their burgers, sandwiches and salads, all outstanding. 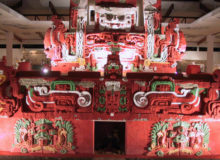 Dinner options include a variety of Mexican dishes, as well as fillet mignon, buffalo wings and much more! Located at the entrance to Coco Loco Bar, Mario’s Place is open nightly and serves island style seafood. 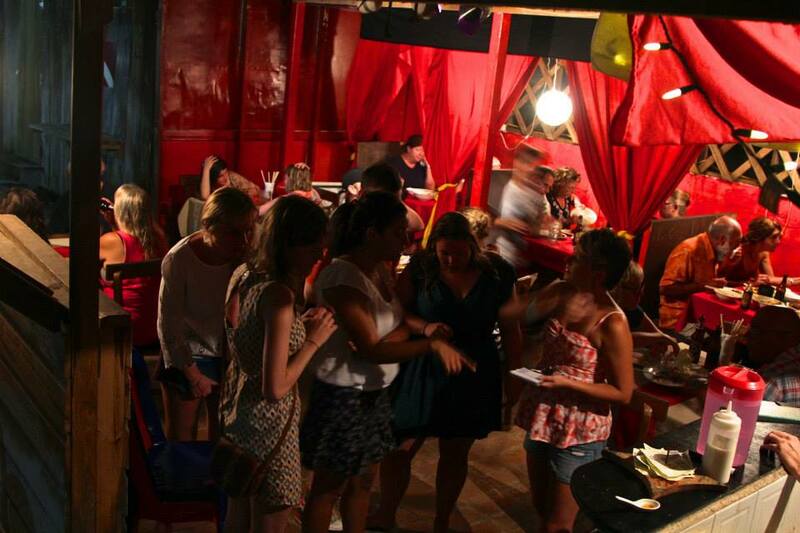 A nice relaxed atmosphere and the perfect spot for a dinner break from the bar scene at Coco Loco! 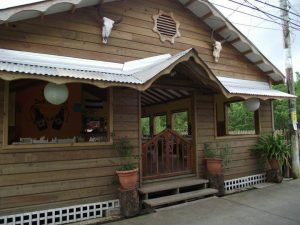 The Italian specialty restaurant in Utila, featuring homemade pasta made with imported ingredients. Try the ravioli and lasagna, which have become the house specialty. La Picola also offers imported beef cuts, as well as a large selection of wines from around the world. The homemade desserts, like tiramisu are outstanding. They also have a nice selection of vegetarian food options. Open Tuesday to Sunday from 5:00 p.m. till 10:00 p.m. They accept and exchange Euros. 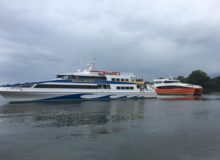 They are at the Sea Eye Resort at the Point. Located in front of Tranquila Bar on Main Street Utila, and open from 6:00 p.m. till 10:00 p.m. on Monday, Wednesday and Friday, Foo King Wok specializes in Chinese and Asian dishes. Great place for tasty vegetarian dinners. Reasonable priced menu offers a bit of everything, with specials including Thai and Vietnam delicacies. 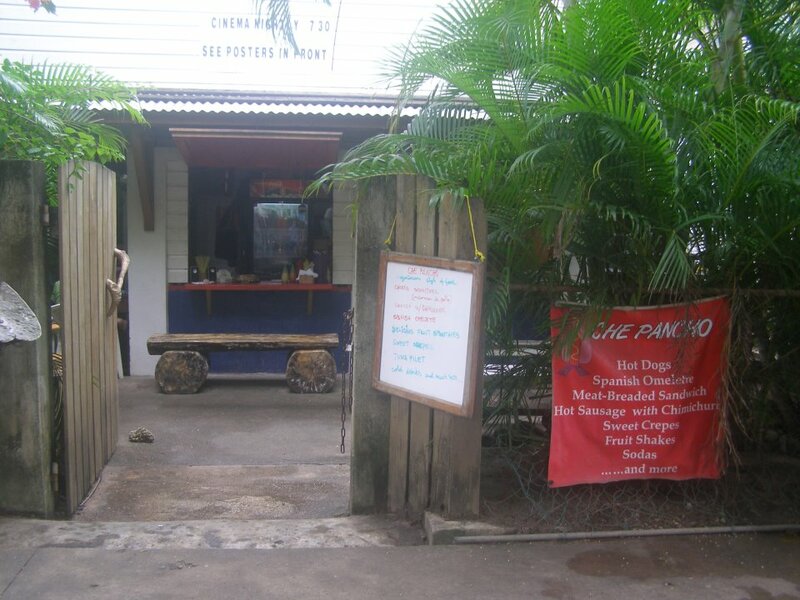 If you are into Asian food, this is definitely your best option where to eat in Utila! Smoothies and light food, Nice location right on the main street at Hotel Utila. Open daily for breakfast and lunch, hot spot offers free wifi for their customers! 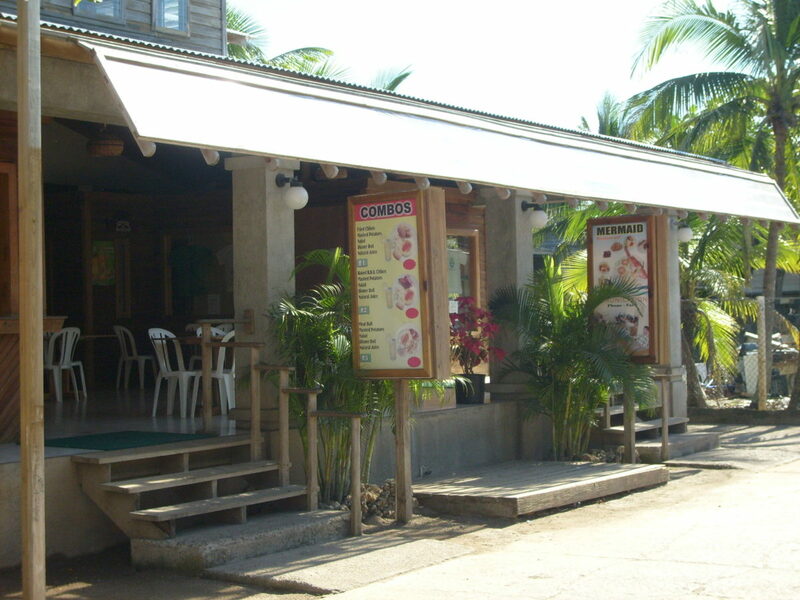 One of the few places on the island where you can get ice cream; their fresh fruit smoothies and juices are great! Really nice setting overlooking Main Street in Utila. Although not officially open as a restaurant, they accommodate guests who wish to enjoy their buffet service with prior reservations. Breakfast is served at 7:00 p.m., lunch at 12:30 and dinner at 6:30. Call in advance or drop by to check out the daily menu. An Israeli specialty restaurant located on the main street of Utila, past the Bayview Hotel, about halfway between the Margaritaville Hotel and the Utila Lodge. Very informal setting. Good selection of vegetarian food. Carlottas Place is located right on Chepe’s beach, and is the perfect resource for that ice cold beer or a snack while on the beach. 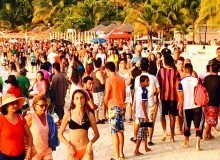 The setting is quite informal, as it should be on the beach, and prices are very reasonable. If you are out to enjoy a sunset at the beach, this is a great spot to use as your base! The Venue is located at Chepe’s beach and offers a great setting facing both the beach and Lower Lagoon of Utila. Sunday special includes a spit roasted hog. If you are looking for decent sized burger, this is where the largest burger on this island is served. Menu includes fresh catch of the day. The Venue is open daily for lunch and dinner from 11:00 a.m. till midnight. It’s a great place for cold beers, tropical cocktails and lots of fun! Located at the Coral Beach Villa, about half ways between Utila Town and the Cays, the only way to get to Neptunes is by boat. Water taxi service is available from the dock at Blue Bayou, with a charge of 50 Lps per person round trip, groups of 5 or more, transfer is free! Open daily for breakfast and lunch from 9:00 a.m. till 5:00 p.m. This is a destination in itself, and the food is certainly worth the trip. Menu is based on American cuisine, including great breakfasts, outstanding burgers and Cajun / Creole cuisine with a Caribbean flair, offering daily fresh catch of the day meals. The Jade Seahorse Restaurant has to be one of the most original and artsy restaurants in the Caribbean! A potpourri of different elements, some local antique elements, as well as plastic toys and junk blend in to create a memorable atmosphere. Food is great, and this is the place to come if you are a vegetarian and even more so if you are serious vegan eater. Open daily for breakfast, lunch and dinner. The Jade Seahorse is without doubt the most original of all Utila Restaurants when it comes to decor! 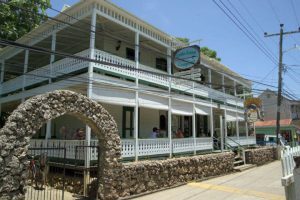 The restaurant at the Mango Inn is one of the best places to eat in Utila. A pleasant, garden atmosphere, good food and service, plus great wood oven pizza make it a local favorite. Open daily for breakfast, lunch and dinner, from 6:00 a.m. till 10:00 p.m. Lunch specials include a variety of burgers, sandwiches and salads to choose from. Ice cold beer and wine served at reasonable prices. 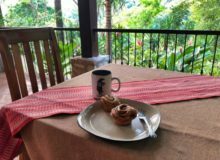 One of the older spots in town, Las Tres Rosas bakery offers the best cinnamon rolls in Honduras! Freshly baked daily, make sure you stop by to buy yours early, as they run out of them quite quickly! You can also sit down and order a breakfast or some orange juice in their basic facilities inside, but the main reason to come here is to buy some of their freshly baked goodies! Sharing the same location with Camila’s Bakery, Pizza Nut is a popular pizza restaurant in town. Pizza nut offers the best pizza in Utila! 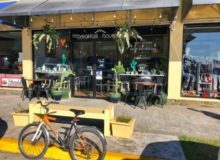 They are open for dinner daily from 5:00 p.m. till 9:00 p.m. and share the same location with Camila’s Bakery, which is open daily for breakfast and lunch. If you like thin crust pizza, then this is the place to go in Utila! You can eat your pizza on site or take out to enjoy elsewhere! 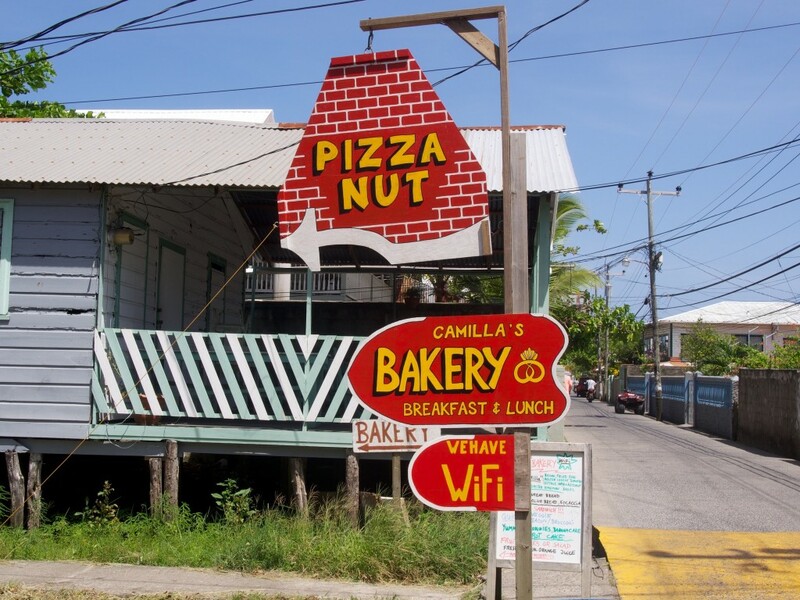 Sharing the location with Pizza Nut, Camila’s Bakery is one of the best spots in the island for breakfast, featuring freshly baked goods, such as baguettes, bagels, quiche and great sandwiches. Coffee and tea are always available, and during season, fresh orange or grapefruit juice are a true special! Open Tuesday to Saturday for breakfast and lunch from from The Bakery offers fresh baked baguettes, bagels, quiche, sandwiches to order and other breads and baked goods. They also have fresh orange and grapefruit juice when in season and always have tea and coffee. great coffee and friendly service. Expat central in Utila! This is where most of the Gringo’s like to hang out to drink their ice cold beers and talk bs every night. 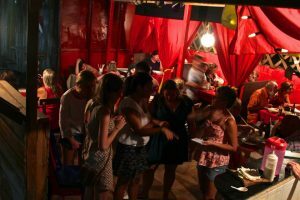 The restaurant offers different Thai specialties, papaya salad, Dim Sum, curries and stir fries; it is a pleasant informal island hang out. It you are a foreigner considering moving to the island, stop by and listen to what all the gringos living here have to say about island life! Located up street from the Mango Inn Hotel. Open daily from 3:00 p.m till 9:00 p.m.